I was broght to Beijing my Maestro Chen Zhi, who is one of the finest teachers in the world today for guitar. His students play at an exceptionally high level, both technically and musically. They were also open to exploring larger ideas of musicality. I gave master classes for several days, and evening concert, and then, a day off! They treated me to a day of visiting the Great Wall, the Forbidden City, as well as diferent night life locations of Beijing. Above on the Great Wall are three of Chen Zhi's students and assistants, who took care of me all day, drivinmg me, translating, and keeping me company. Beijing was a culinary experience I won't forget. Besides Peking duck (a dish originating in Beijing - Peking is the original name for the city), we also sampled many local specialties the were works of art. My favorite was slices of pork and an unidentified Chinese green	(kind of like kale) that was roasted in a large tube of bamboo. Unbelievable. Above to the left is Chen Zhi with his wife, and Four Angels, a guitar qyartet of Chen's students. I first heard the Four Angels in Ithaca New York, where they opened for my evening concert at the GFA convention. On the right photo, a soldier taking a quick nap on his scooter. I dared to take his photo since his hat was over his eyes. Chen Zhi again with his wife, and Jae, another teacher at the school with Chen Zhi. Here is the Beijing Men's Quartet. They played a piece for me that I wrote for them called "DissFunkShun", a very strange and mechanistic piece, they played it superbly well. Theys guys are fantastic, maybe the best quartet I've hear in years. On the right is Qing, who translated all my teaching. His skill is world-class; I could explain long, complex ideas, and he would quietly listen, and then translate everything with all clarity and subtlety retained. Without him I would have been lost, and teaching wouldn't have been so successful. A strange moment - here at the edge of tiananmen square, a huge crowd of people was constantly milling about. At one moment, for some reason, there was nobody in front of the monument, though hundreds of people were just off the frame of this picture on both sides. 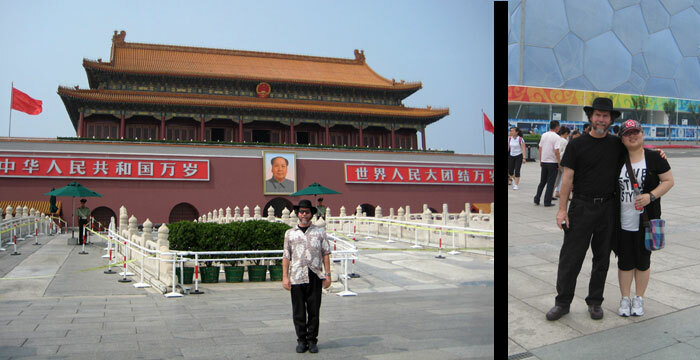 I was able to get this photo quickly while there was no one else around but the two guards, and Mao of course. To the right is another student who translated for me also, made sure I was fed and didn't get lost walking to the school. Her name is Cici. Here is a photo of the new Beijing concert hall. It is next to Tiananmen square, and is an amazing and aesthetic structure. To enter the building, you walk under a huge pool of water, and it throws light down from the ceiling as you traverse the entryway. And here is a bolt of lightning I captured from my hotel room! Storms rolled through on three nights while I was there, and the lightning was at times continuous. Jurgen Reinke runs a great festival in Oberhausen called Gitarrissimo. I played there during a rainy November. 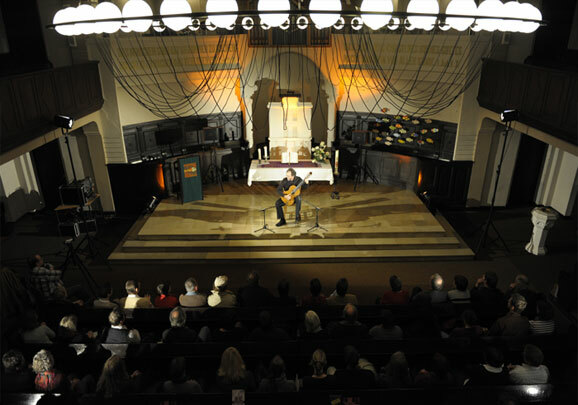 A great crew delivered a first-class amplified sound at the church venue (see videos below). Jurgen is crazy for castles, and showed me some fine examples around this area of Germany. 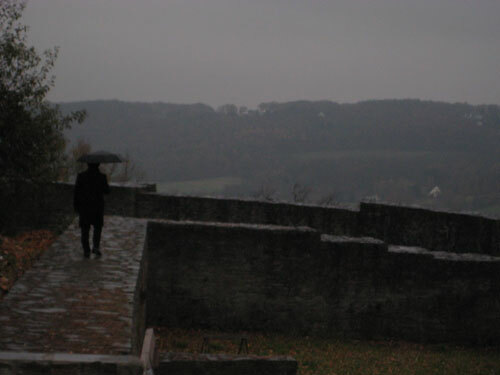 Rain didn't stop exploration of some of the medieval villages and castle ruins. A strange and humorous final bow, like a monkey doing yoga. I have just finished mixing my latest CD, Centerpeace, a collaboration I have wanted to do for many years. Allaudin Mathieu and I did a series of free improvisations on piano and guitar, and I'm very excited about these. 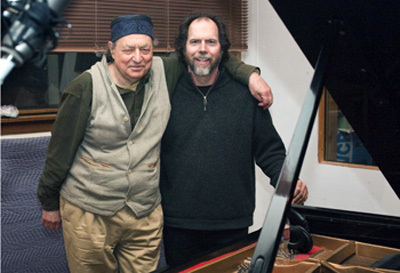 He is a master improviser and working with him was a very memorable and special experience. 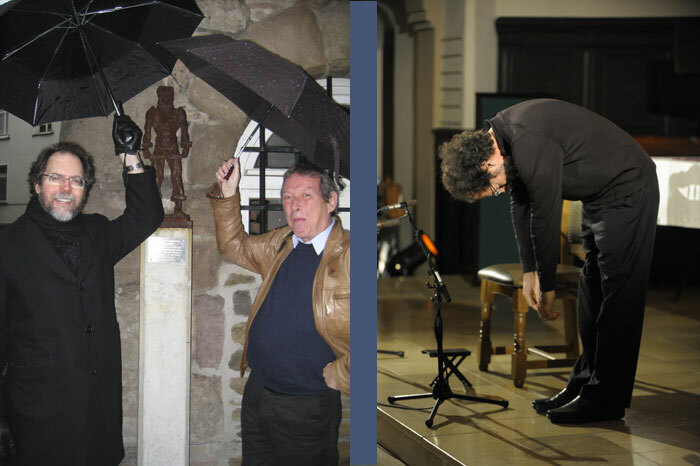 We recorded in Sebstapol in one evening, during a steady rainstorm, which lent a certain evocative mood to the session. 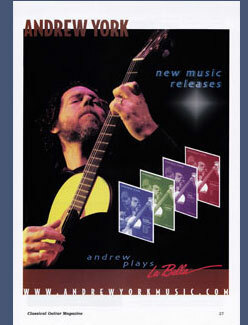 Half the CD will be free improv with Allaudin. 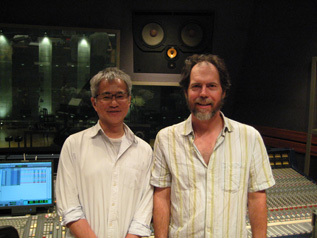 Also with me on the CD: Last July I flew to Japan to record with the wonderful Japanese classical pianist Mitsuko Kado. We tracked my piece "Sakura Perspectives", a theme and variations on the Japanese folk song Sakura, for guitar and piano. Mistuko also recorded two of my solo piano pieces for the CD. 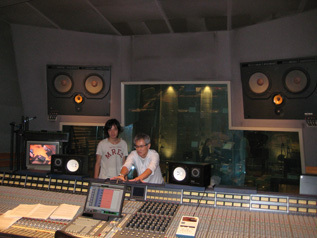 In the photo, on the left is Atsuo-san, who engineered the session. To the right is the producer, Takao Kasahara, with Mitsouko. 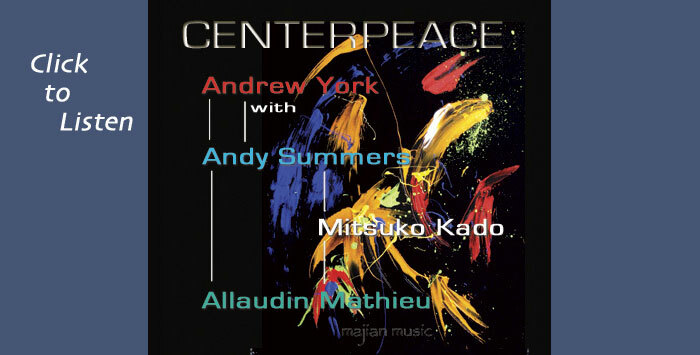 The title track is the first piece Andy Summers and I ever recorded together, Centerpeace. Done last July, it's a multi-track work and Andy laid down some beautiful textures with a number of electric tracks, as well as playing steel-string guitars. It's a moody and evocatvie journey in B minor that works its way around to E minor by the end. Our collaboration continues with another entire CD together, Spirit Garden . 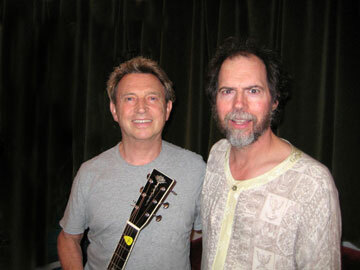 . .
Andy Summers and I took two months early this year to build our new CD, Spirit Garden, from the ground up. 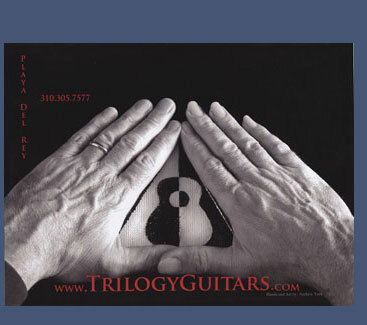 About half the CD is just two acoustic guitars with no overdubs. The rest of the tracks are larger multi-tracked works where we play all the instruments. 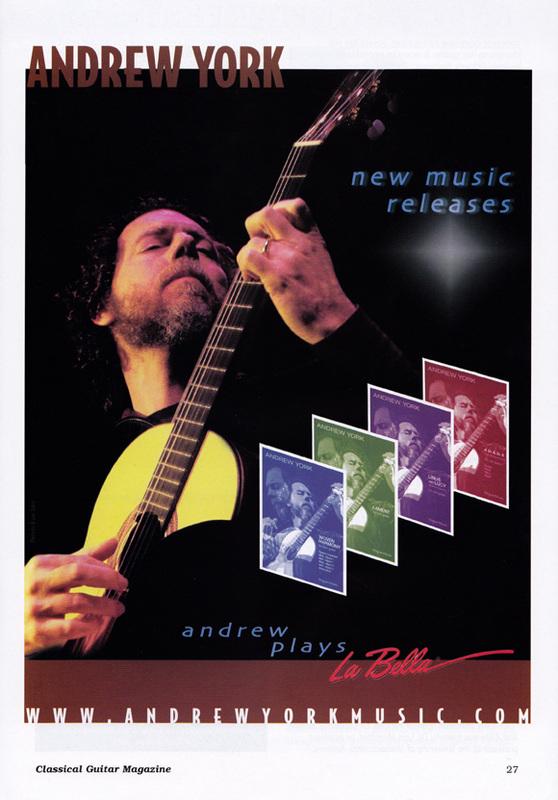 Stylistic range for this work is enormous, from African grooves to free improv to written-out classical style works. Dennis Smith engineered and mixed and captured all the days of sudden takes, are we rolling? . . . Here are some recent magazine ads. First one if running in Classical Guitar in the U.K. 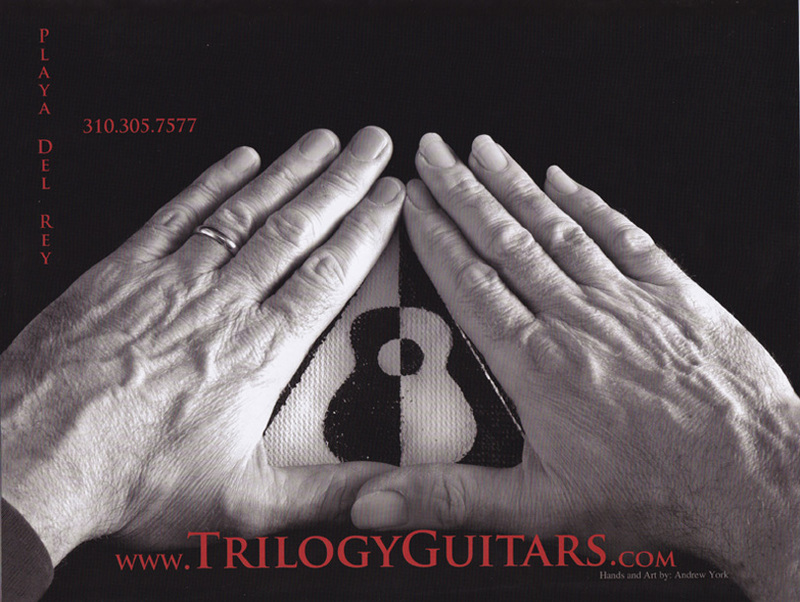 The second, for Trilogy Guitars, features a painting I did on cloth of the Trilogy logo, and those are my hands around the painting. The excellent photo was taken by Jeff Zucker. Click on the ads to see a larger view.